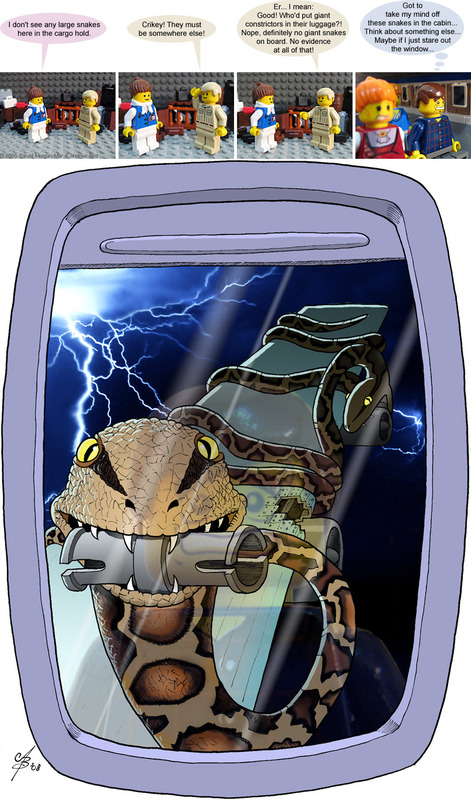 1 Stewardess: I don't see any large snakes here in the cargo hold. 2 Steve: Crikey! They must be somewhere else! 3 Steve: Er... I mean: Good! Who'd put giant constrictors in their luggage?! Nope, definitely no giant snakes on board. No evidence at all of that! Thanks to the artistically talented Andrew Bird once again for providing custom artwork. I struggled for a while thinking how I could illustrate this one with LEGO pieces, but in the end it was far easier (for me) to ask Andrew to have a go at drawing it. And I'm very glad I did. 2018-10-08 Rerun commentary: This sequence involving the snakes out on the wing is an homage to a classic episode of The Twilight Zone: Nightmare at 20,000 Feet. Which guest starred William Shatner, no less.